Like probably the majority of Coralines this 550 runabout was subjected to considerable customising. And, as usual, the owner is a strong minded fisherman. His special requirements started with a complete absence of decorative paint; the only item sprayed or brushed is an anti skid coating on main and foredecks. Like all Coralines the 550 is self draining so to delete the transom door is unusual, although the boarding ladder remains. A classic minimalist approach: if it is not needed why have it? An advantage is that, added to an absence of transom seating, there is an unbroken coaming around the cockpit. A large removable bait board sits above the twin transom lockers and a powered deck wash is stowed at the rear of a side pocket. This boat is going to operate wide in the waters off Bunbury so the owner asked for the biggest fuel tank that could be fitted – and coupled that ask with one for the largest possible catch tank. Not an easy partnership, with considerations of trim as well as simply finding the room. The builder made a good job of it though, with a 170 litre fuel capacity and a catch tank of unstated but clearly vast dimensions. The trim calculations were equally successful: trials demonstrated a boat that needed only the smallest applications of trim button to set up for changing conditions. A Bimini with associated clears mounted on an unusually beefy frame protects the cockpit’s business end. The Targa arch is lowered with a minimum of fiddling to fit under low roofs, or to simply reduce air drag when towing. 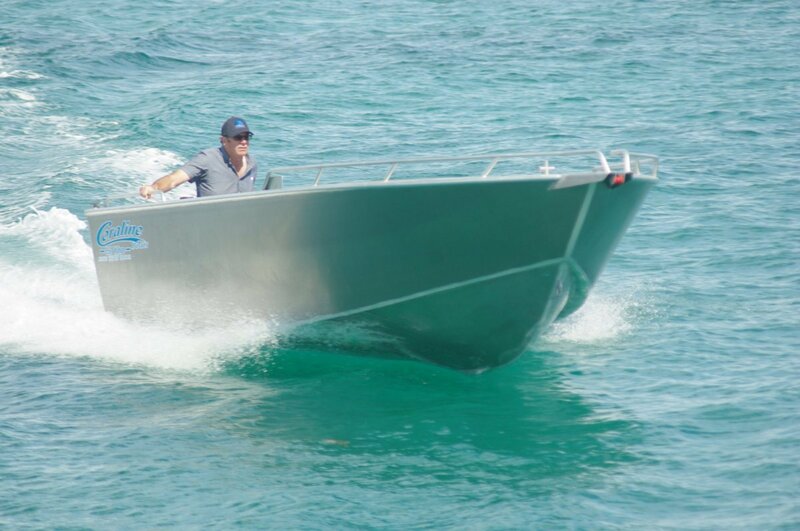 This Targa has a rank of rocket launchers, teaming with coaming rod sockets. These sockets are aluminium, welded in place rather than glued or screwed. Just two seats are fitted, reversibles mounted on locker boxes. Ahead of the driver’s is a pair of Furuno screens for the 1kW 588 sounder and the GP1870 with C-Map. Separating navigating and fish finding functions is becoming more popular. Sharing dash space is a busy set of switch gear: extras include spot lights and deck flood lights as well as the near compulsory stereo. On top of the dash is a pair of drink holders of sculpted quality, in stainless steel instead of the usual fold-out plastic breakables. The owner wanted no side grab rails – interior hand holds are limited to a bar ahead of the navigator. 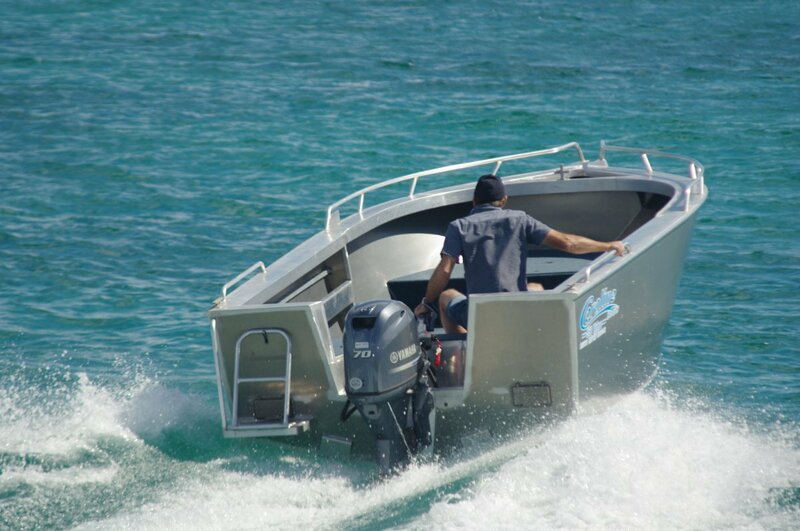 The 550 is generously powered by a 115hp Yamaha four-stroke – all the better for getting out wide in a hurry. Like all the bigger Yamahas it comes with hydraulic steering, in this case controlled by an up market stainless wheel. Under way there were no surprises from motor or boat. All the current Coralines share hull characteristics: a sharp forefoot merging into a steep deadrise bottom balanced by broad reversed chines. Differences in behaviour between boats are mainly due to size; vertical accelerations being reduced with increasing length. In the moderate conditions of the review day our 550 behaved predictably and well at all speeds. At rest stability was above average. The usual crew will be two; the two available for the stability test were not lightweights, suggesting a first class fishing platform for the owner. The dual axle trailer is very much a beach launching special, tailor made in aluminium by Coraline themselves. The draw bar can be extended by 1.5 metres; launching and retrieval is sped up by an auto catch and release system. An unusual combination with that capability is a mesh plank to make life easier and drier for anyone hooking on manually. Beach retrieval can mean a hard life for the bottom’s forward end; Coraline compensated for that by replacing the standard 4mm plating with 5m.